The Downtown area of Grand Bend is both fascinating and interesting. Known officially as Plan 24 and affectionately as " The Jungle " many people love it or hate it with more and more moving to the loving it side. The " Jungle" has been party city for decades. Most cottages were built in the 30's, 40's and 50's as unheated unwinterized cabins and of course used only in the summer. During the 60's and 70's it really became "party town" as the "boomers" discovered how easy it was to get here and how great it was to be here. The lots are small, the downtown bars and the beach are all right at at hand making it cozy, friendly, fun and exciting. Things are changing and the party image is fading as those same "boomers" are coming back, this time with money and kids and /or thinking of retirement. Renovations, tear downs and rebuilds are everywhere. The key ingredients that made it great still exist and that old real estate adage of " location, location, location" is entirely at play with the great beaches, restaurants, bars and shopping right at hand. Prices are reflecting the increased interest as well. Into the late 1990's and early 2000's almost everything was available under $ 100,000 with an average price around $ 50,000. 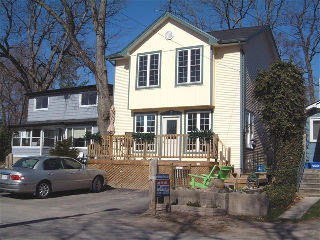 Now a tear down is hard to find and would be around $ 150,000 with most prices now $ 200,000 and above and increasing. A new 30 house development scheduled to start this year on Queens Ave will have prices $ 300,000 and above as well as 3 new homes being built at Oak and Warwick also touching that price range. 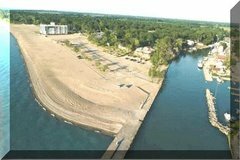 Now is the time to jump on the band wagon because there are no new lots being developed anywhere in Grand Bend on the lake side of Hwy 21. This is also a very popular area for people wanting to rent; this time with families in tow . So buying a cottage/home and renting it out a few weeks helps affordability by covering most of your carrying and operating costs. The Party image is all but faded with the exception of the May 24 weekend, but the fun and desirability is stronger than ever. The two cottages at the top of the page are year round homes and both for sale. 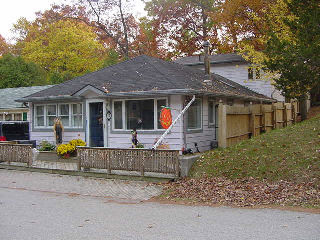 If interested let me know by phone 519 238 5700 or e-mail larryb@grandbend4sale.com. Posted by Larry Broadley at 10:02 a.m.